I recently had the opportunity to review the book Before Five in a Row. It is a book full of ideas geared towards children around the ages of two to four years old. I have a six year old and a two year old and they both enjoyed different parts of it. This book is kind of like a guidebook to early learning. It gives you ideas and activities to help you not only bond with your child, but also to get them help them develop a love of learning. And although it's age range is just right for my littlest one, I was able to easily work in things to keep my six year old interested as well. The first part of the book has twenty-three mini-units centered around different picture books available in many stores or at most local libraries. (A few of the books used in the units are out of print so they were a bit more difficult to find.) The activities and ideas are all categorized by what subject they cover - Bible, Science: Animals, Memory, Art, Relationships: Family, and so on. The activities my kids enjoyed the most were from the units on Goodnight Moon, Blueberries for Sal, The ABC Bunny and Corduroy. ~ Grocery Store Scavenger Hunt: Give your child a list with pictures of the things you need from the store so they can help. ~ Homemade Instruments: Make homemade musical instruments out of things you have around the house. There were many more ideas but obviously I don't want to list them all! I think if you're a Mom of little ones you will like this book. It gave me lots of neat ideas. It also reminded me that my kiddos are only little for a sort time and that learning happens in a lot of different ways! 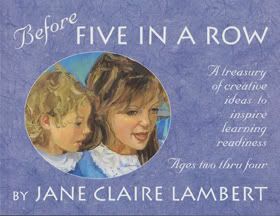 Before Five in a Row costs $35 and can be purchased from Rainbow Resource.You can read more about the book on the Before Five in a Row website. Disclosure: I received this book free for providing my honest opinion. To see what other TOS members thought of Before Five in a Row, please go HERE. Great review Shay! :) Although I didn't write it in mine, one of my many favorite things, was the grocery store hunt. I always dreaded going, especially when I had to take all the kids and we would be in there for awhile. Now it is fun, especially for them (I just have to put the bread, buns, etc...under the cart! ;) ) I love the look of your blog, you changed it around some. :) Very cute!! I have been enjoying this with my prek-er this year! I, too, want to enjoy these years as much as possible! Btw, I see that you're a Hoosier :) Me too :) It's fun finding other bloggers out there from the same state!